I’d never heard of halogen ovens until we were asked to review one, but with a new kitchen next on our wishlist of home improvements, it seemed like a very good idea to have a back up oven. 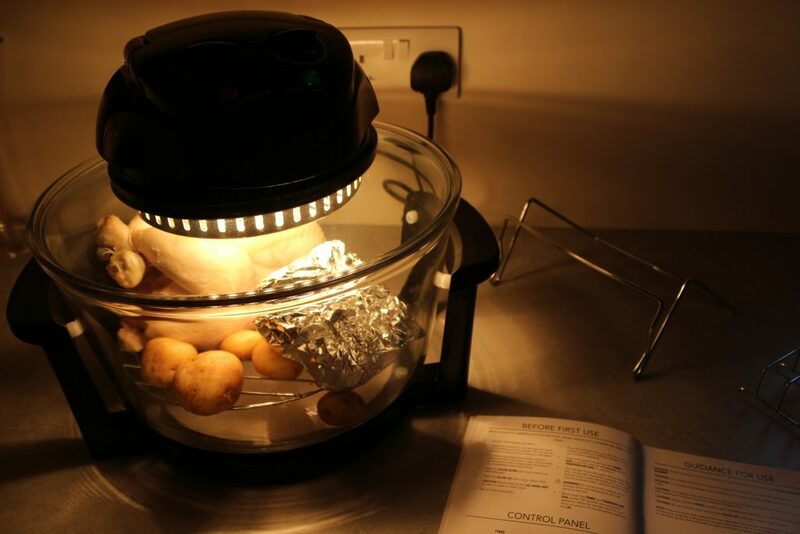 We were sent the 12 litre VonShef Halogen Oven to put to the test! 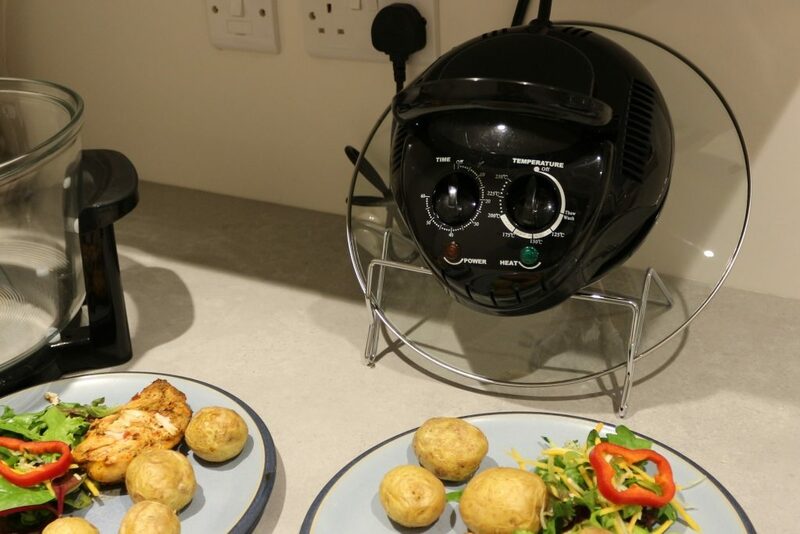 A halogen oven is a self-contained worktop cooking device which can perform most functions of a gas or electric oven, including grilling, roasting, baking, steaming, frying, barbequing, broiling, reheating & defrosting. 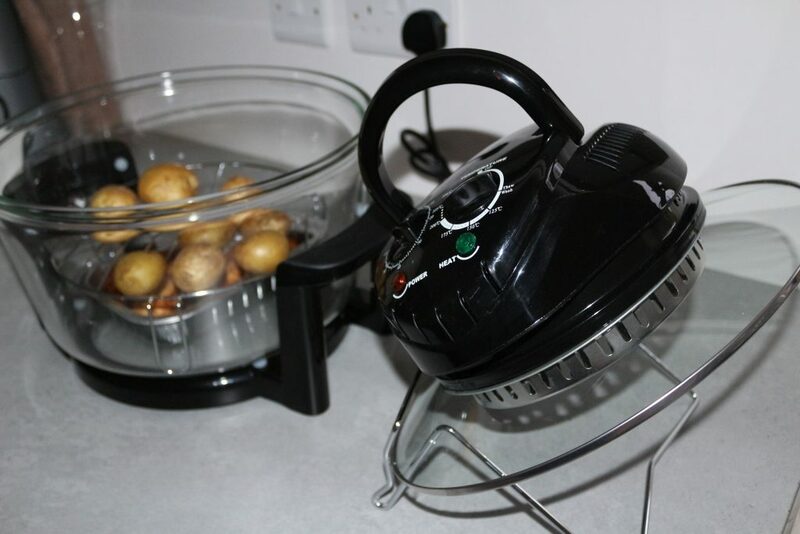 It looks a bit like a slow cooker, but is in fact the opposite! 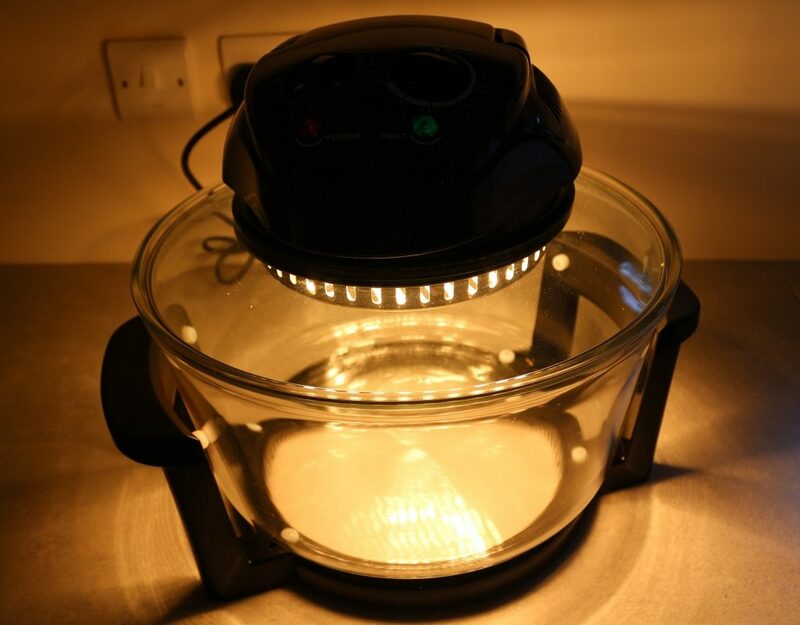 It is much smaller and more efficient than a conventional oven, this VonShef Halogen Oven comes in a 7 litre model and a family sized 12 litre model. The oven itself is a big glass dish with a stand that it slots into and a glass lid with halogen light, timer and heat switch. You also get in the box: An extender ring for cooking larger quantities, a steamer, circular frying pan/baking tray, bread rack, two wire racks (high and low) for roasting, some tongs for picking up the racks/baking tray, skewers and a holder for the lid. 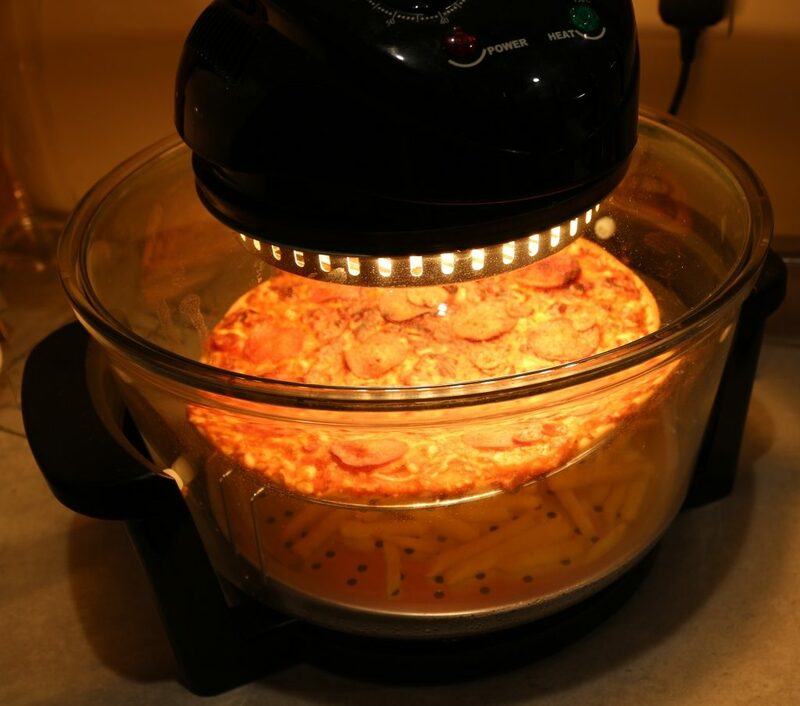 Why get a VonShef Halogen Oven? bviously it depends what you cook in it, but it’s healthier than frying! There’s no pre-heating and it cooks food much more quickly than a conventional oven; marinated chicken breasts were cooked through in less than 20 minutes and a whole chicken roasted in under an hour! This is brilliant if you have hungry kids to feed after school who don’t want to wait. 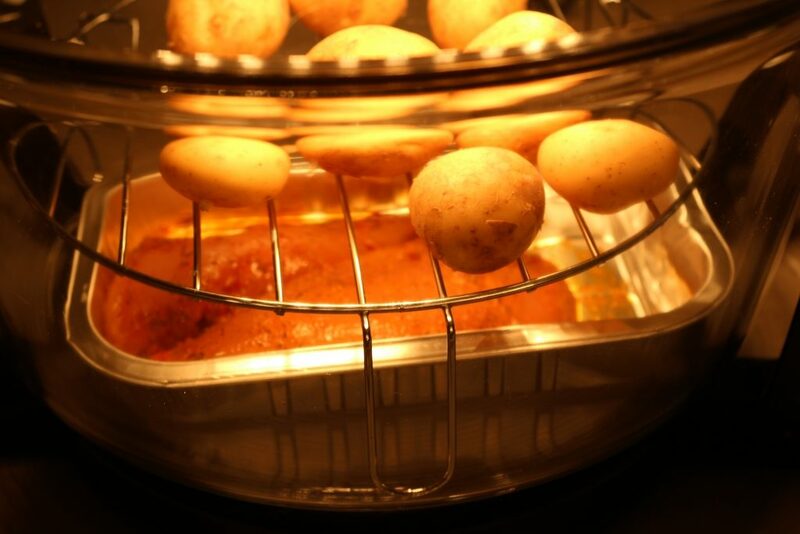 Because it is quicker, the VonShef Halogen Oven uses less energy. Looking at our smart meter I was pleasantly surprised that putting the halogen oven on didn’t tip us into ‘red’ territory; on top of the usual 4p an hour cost of running the fridge, fishtank etc it added around 17p per hour which considering it isn’t on very long seems good to me. The glass bowl is fairly easy to clean. It has a self-cleaning function, whereby you put a few litres of water in it with some washing up liquid and let it do its magic before pouring the water down the sink. It fits inside my large kitchen sink for a good scrub down when messy food has been cooked. You can see the food cooking so there is no need to keep opening/closing the lid. 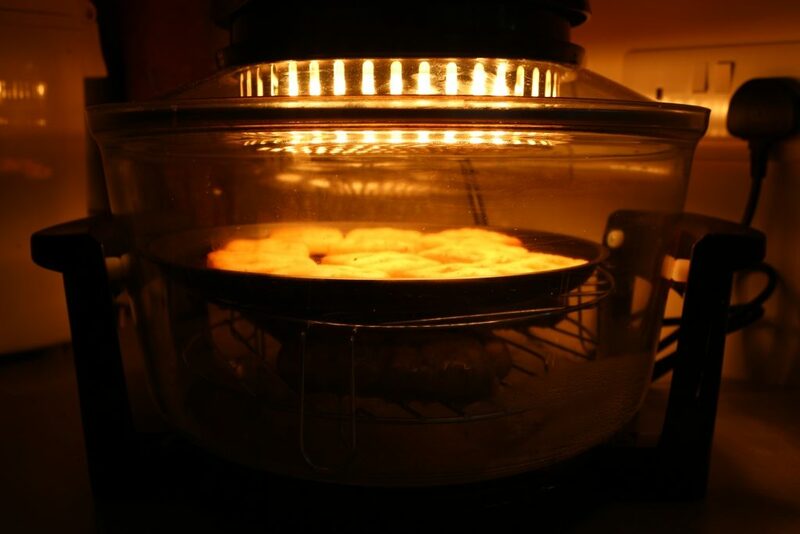 What can you cook in a halogen oven? Anything that will fit! You can roast, bake or cook from frozen. There are Halogen Oven cookbooks (this one has good reviews) if you’re looking for inspiration. Oven pizza and chips (the pizza fit straight on to a rack; this is a definite pro of the bigger oven!). I’ve been told that it’s even possible to cook bread and cakes in the halogen oven, but as we have a breadmaker and I’m not much of a baker, we’ve not put this to the test. When you first get the oven, you need to turn it on empty for ten minutes in accordance with the instructions. This leaves a strange kind of smell, but this should disappear after the first use. Don’t be put off! If you’re used to a conventional oven, getting used to the timings might involve a bit of trial and error. If you set the timer based on the time it would usually take in your oven and walk away you could come back to an overcooked dinner! It’s bulky, so you need a fair amount of space on your kitchen worktop to place the oven and the lid. There is a smaller, 7 litre capacity, halogen oven available which would be better for people who only cook for 1-2 people most of the time. The unit is heavy, and if you have cupboards above your worktops it can be tricky to get the lid on and off which needs a bit of practise. The tongs are the right size to pick up the baking trays but again, tricky until you know how. Unsurprisingly given its function, it gets VERY hot and if you have pets or small children, you need to make sure they can’t reach it. I was surprised at how quickly and well it cooked and how easy it was to use, and the range of food it could be used to cook. The fact it saves energy is a huge bonus! We have not used our conventional oven in over a week! We will definitely consider getting a single oven with hob rather than another double oven to save space in the kitchen in the remodel. 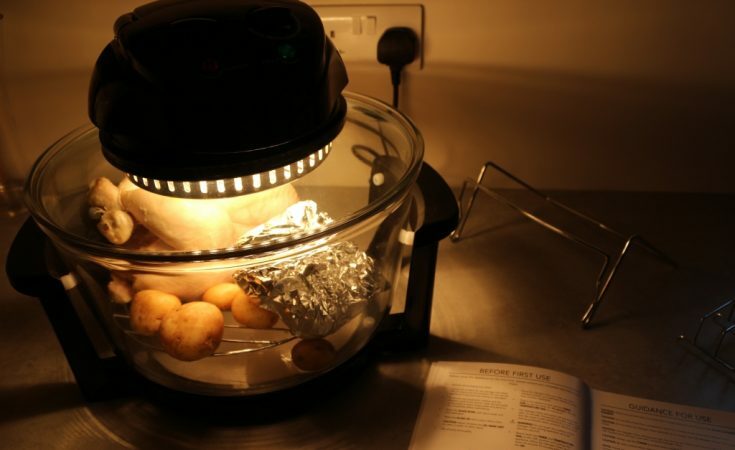 I wouldn’t be able to give up my conventional oven completely as it wouldn’t be possible to cook whole-family roasts like Christmas dinners, but the Halogen Oven will certainly get a lot of use. It would be handy if the racks could slot on top of each other so that you could cook more; this feels like a bit of an oversight. I might look into buying some new racks for it so that I can cook on more layers. But apart from that I would definitely recommend getting one! 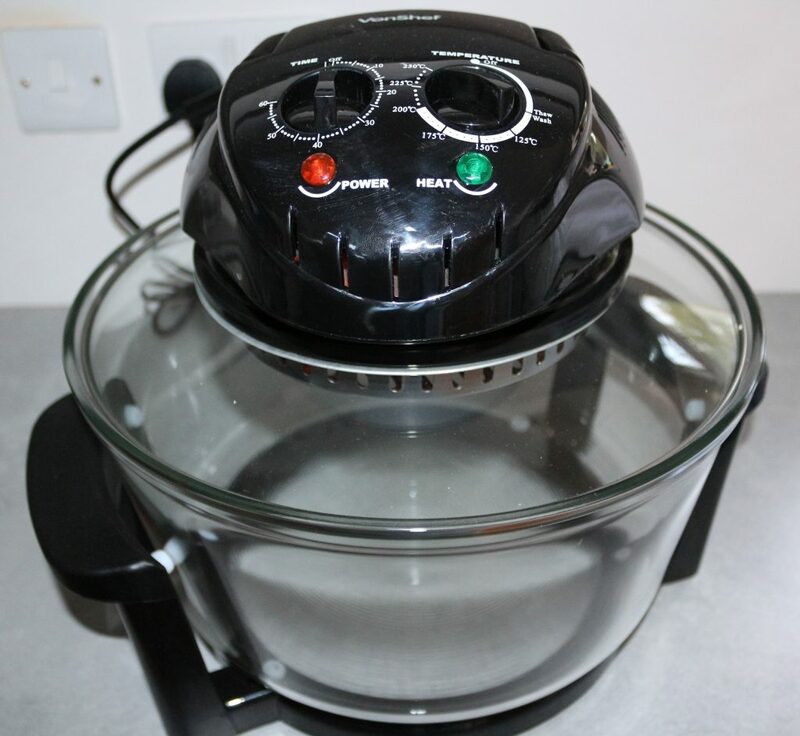 The VonShef Halogen Oven 12 litre model has an RRP of £44.99. You can buy one from Amazon using the link below. 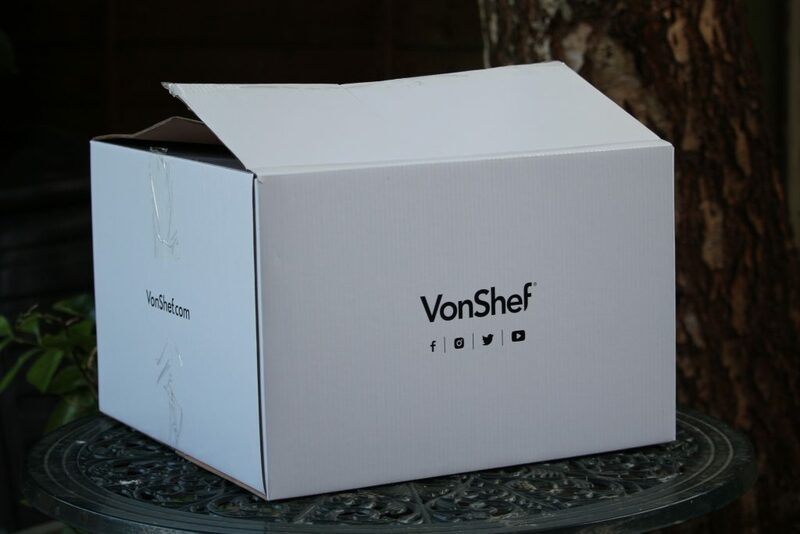 Fancy winning your own VonShef Halogen Oven? Enter our competition below! 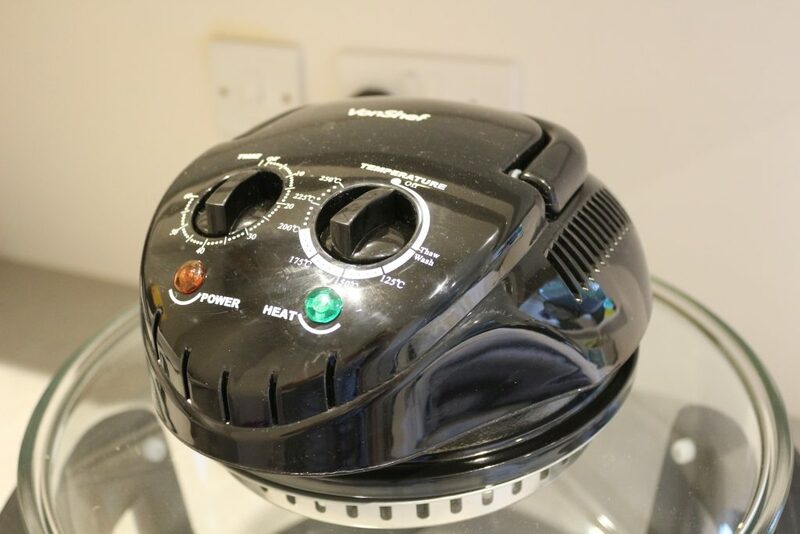 We received this Domu Brands VonShef 12l Halogen Oven free for the purposes of this review but all words and pictures are my own. I love that you can cook pretty much anything… and it is self cleaning! Looks good. I have a slow cooker but this looks much more versatile. I love how easy it is to use and the range of food that could be used to cook. The most appealing thing to me is that it looks good, but more importantly, it is self cleaning. Looks amazing. I really really want one now! The self-cleaning feature is very attractive to me. Love that you can roast a chicken without much mess or having to use the kitchen main oven. I love cooking healthy meals for my family. I have an 18 month old daughter which gets very hungry and I’m always rushing to get the dinner ready. I love the fact you don’t need to preheat the oven and there’s even cooking throughout. Whilst dinner is cooking, i can just spend time with my daughter when the food is done, without turning the food, which is brilliant! And the self cleaning is a bonus too! Oh wow I love that you can bake bread in it, that really would be amazing! 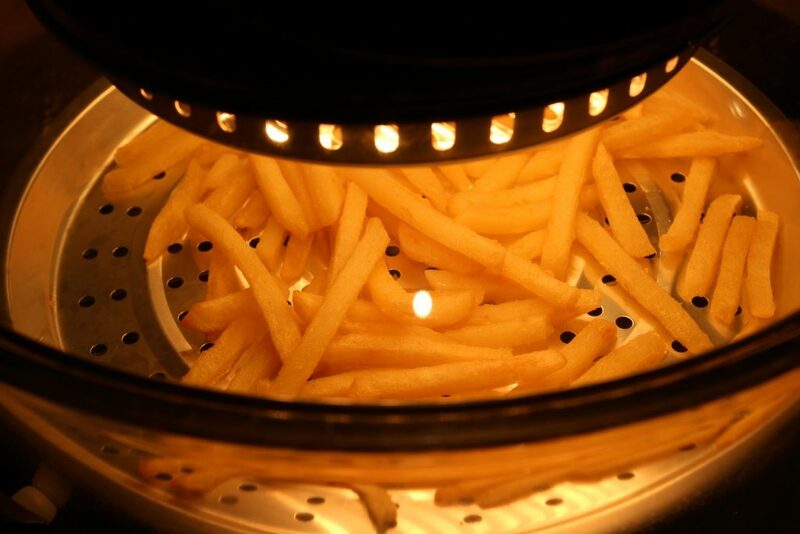 I love that it is healthier than a standard fryer. I would love to cook my food in this beauty. I love all the different types of food it can cook as it saves having lots of different appliances in the kitchen. I like the fact that it’s a healthier way to cook, self cleaning and energy efficient. Perfect for family, or cooking for yourself. You mentioned that it’s easy to clean/self-cleaning – what about the lid, with the electrics attached? Or are they detachable? Love the fact it’s self cleaning and so cheap to run! I love that it is self cleaning. Best thing ever! I like that it has a timer on it! Love the self cleaning idea – saves me the pain as putting pressure on anything hurts due to injury in hands/arms.shoulders/neck lol! I like that you can vary the temperature, we had a halogen before and it only cooked on high or low which was a bit of a pain! Self clean does nothing, and it won’t cook a lot of things, particularly chicken unless you like black skin and raw meat. It’s a handy thing to make snacks and light meals , it’s more like a grill than an oven though. I had one for a while and eventually the wire in the lid rots and falls in your food. Miss it for quick stuff though. Just don’t get hopes up how much it actually does. I’ve cooked everything in it for the past two weeks and not had any trouble with uncooked food. Was it the same model? I’m a convert! I love that it’s quick – and that you can bake bread in it too! I think its good for cooking food quicker, ideal when you in a rush. Defo the self cleaning feature! This sounds very handy, I look the fact that it cooks food much more quickly. 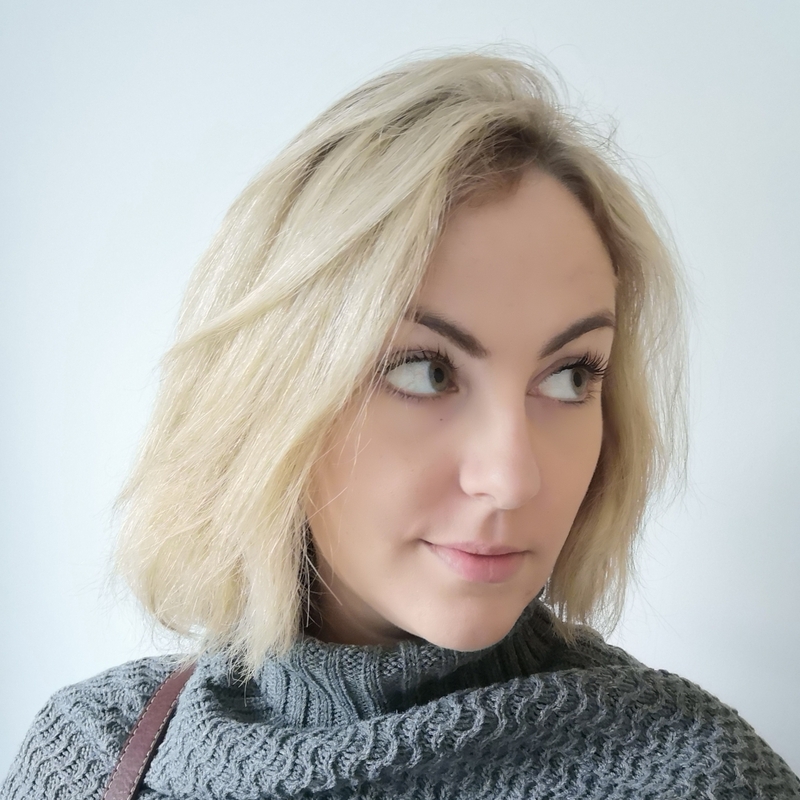 Great that no cooking fat is needed, this is a huge bonus…. There are too many amazing features on this product I can’t name just one so I’ll name my top three. 2) self cleaning sounds perfect for me as my disability makes cleaning things harder. 3) worktop cooking so no bending down! It cooks quickly and with less energy, sounds good to me. I love one-pot dishes and this product takes that up a whole notch as I can cook two different things in one! I like that it heats up so fast, time saving. I like that you can cook a variety of food, even chips! It’s a very handy bit of kit. It’s got a lot of good points, but the self cleaning one is what’s selling it for me. It will make roast dinners really easy to do. I love that it cooks quickly and saves energy. I love that it is self cleaning! Apart from all the great things you can cook in it, I’m all for saving energy. That it’s multifunctional and you can do all this! 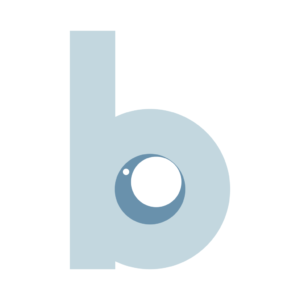 – grilling, roasting, baking, steaming, frying, barbequing, broiling, reheating & defrosting. Absolutely love the variety of food it can cook! and loving the self cleaning,this would save so much time and washing. It looks easy to use and I like the self-cleaning feature. I love that it sounds very versatile and able to cook, bake, defrost, etc. Basically sounds like it’s pretty much able to do almost anything. 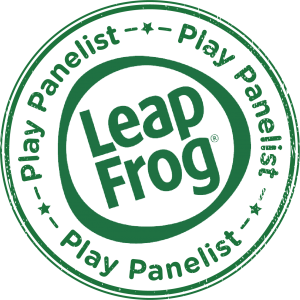 But perhaps my favourite feature would have to be that is sounds easy to clean (at least much easier than a normal oven), especially with the self-cleaning feature which you said about in the review. Its Self Cleaning! Thats get my vote! I love the fact that it is so energy efficient! I think my favourite feature is that you can see exactly what is cooking all the way round! The self cleaning feature is definitely a bonus for me. The fact that it saves energy and cooks so quick would be top of my list. That and the range of things you can actually cook in it. The fact that it’s self cleaning is a big bonus. My slow cooker is a nightmare to clean. I love that it uses so little energy, definite bonus! The words ‘self-cleaning glass bowl’ are jumping out at me, that’s definitely a feature I love. its easiy to clean than a normal oven that has to be the best feature and its quicker. The self-cleaning function sounds pretty good to me! I love that there’s no preheating, perfect for gettin dinner oh quick when the kids are hungry. This looks great and more energy efficient than putting the whole oven for a smaller amount of food! I like the idea of this portal little number, would be really helpful to have something like this in my life. I love that it is self cleaning….winner!! The fact this can fry is impressive! I love that it saves energy! Healthier way to cook, less fat, I like that. I love the self cleanning feature. IT IS QUCKER, HEALTHIER and self-cleaning.